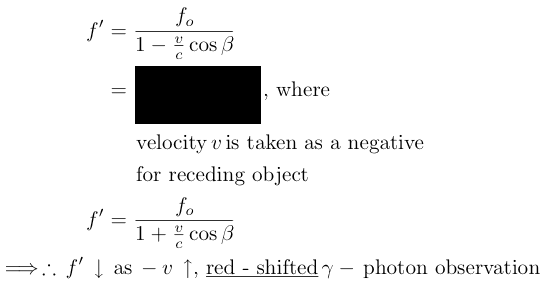 note: be aware that the majority of these equations are derived for straight line of sight inertial motion versus transversal (perpendicular to sight) motion. 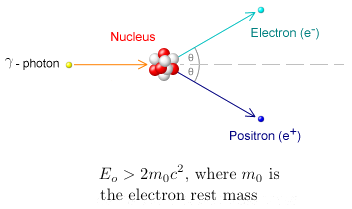 where the moving atom experiences a recoil and acquires a new velocity and is the atom's natural oscillating frequency when observed at rest and the observer staying right at the reference frame of the atom source. 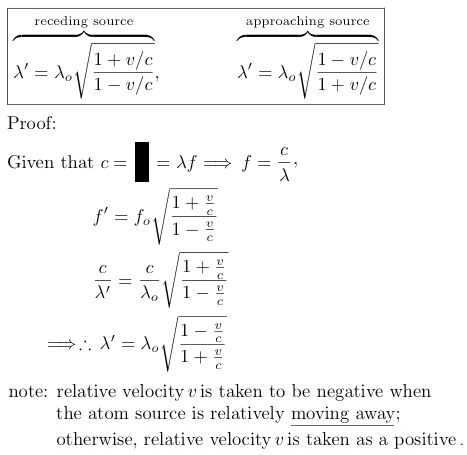 note: relative velocity is taken to be negative when the atom source is relatively moving away from the observer in stationary system ; otherwise, relative velocity is taken as a positive. 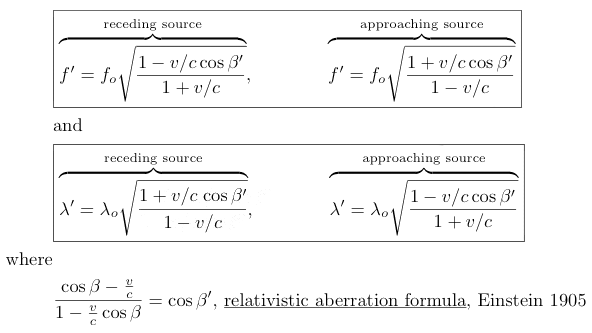 This is extremely important when considering these equations!! 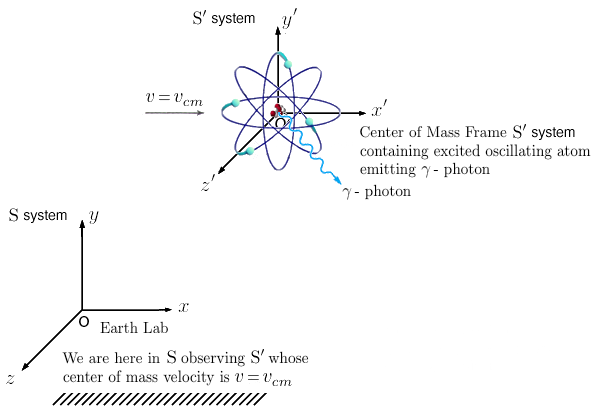 is what produces the Doppler Effect for our source atom emitting ! Johann Christian Andreas Doppler ( born Salzburg, Austria, 1803 - died Venice, Italy 1853 ) is the Austrian mathematician and physicist after whom this observed wave - frequency shift is named; ironically it was as a result of the 1866 Seven - Weeks War that "shifted" Johann Doppler's grave site from Austria to Italy. That is, take up another perspective in stationary system so that the atom source for lies strictly along the x - axis and hence implying . 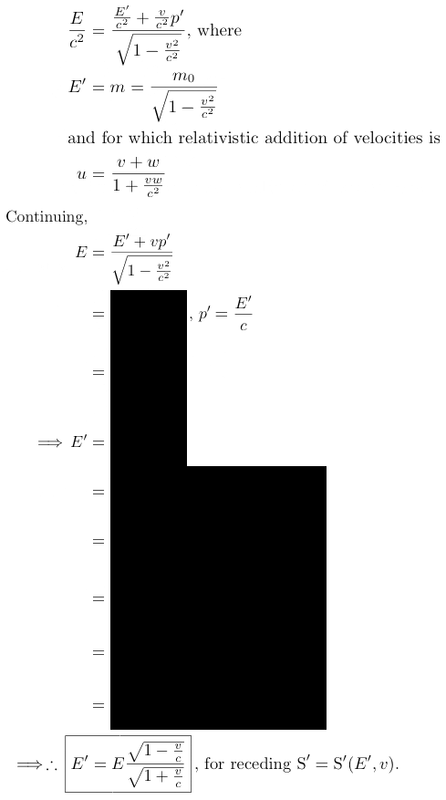 Please see part §7 bottom, page 16 - 17, of Einstein's 1905 paper, "On The Electrodynamics of Moving Bodies" for Einstein's ( abrupt ) presentation of this Doppler equation with the substitution of as being taken as . In the extreme case of , the atom source for no longer exists - i.e., it goes to zero and disappears! never quite goes to zero. 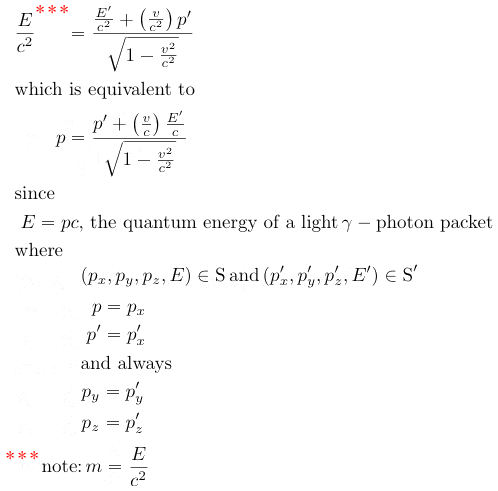 What this signifies is that because of Lorentz transformation of relativistic moving inertial frames of reference, that there are inherently analogous and different energies for equivalently different [ gamma - photon ] frequencies as revealed by the Doppler Effect! On the other hand, we have seen that becomes extremely small whenever is extremely large but not at , however there surely must be a lower limit for when hits an atomic nucleus and thereby produces an elementary particle and its anti - particle! In any event, an oscillating atomic nucleus is required for any pair production to occur where any lost p.e. ( potential energy ) within the nucleus due to impact creates a compensating anti - particle; hence, the laws of conservation of momentum and energy are maintained. Paul Dirac ( 1902 - 1984 ), British theoretical physicist and founder of modern quantum physics, produced his famous Dirac equation in 1928 which predicted atomic pair production and hence the existence of such anti - particles as the positron for which Carl David Anderson ( 1905 - 1991 ), American physicist and son of Swedish immigrants, together with Victor Hess ( 1883 - 1964 , Austrian - American physicist ), won the Nobel Prize in physics in 1936 after having confirmed its existence during one night in 1932. Paul Dirac also shared the 1933 Nobel Physics Prize with Erwin Schrödinger ( 1887 - 1961, Austrian - Irish physicist ), for their joint contribution in atomic theoretical physics, especially for the Schrödinger equation. Paul Dirac was an avowed atheist. Erwin Schrödinger, a born Catholic, nevertheless escaped Nazi Germany because of his opposition to German anti - Semitism and persecution of Jews and therefore finally fled with his wife in the summer of 1933 to South Tyrol, Italy. Later in 1940 Schrödinger helped establish the Institute for Advanced Studies in Physics, Dublin, Ireland, in which country he eventually adopted Irish citizenship. Finally, in some sense therefore, we have come full circle to the beginning of our schema of a moving atom source for the emission. 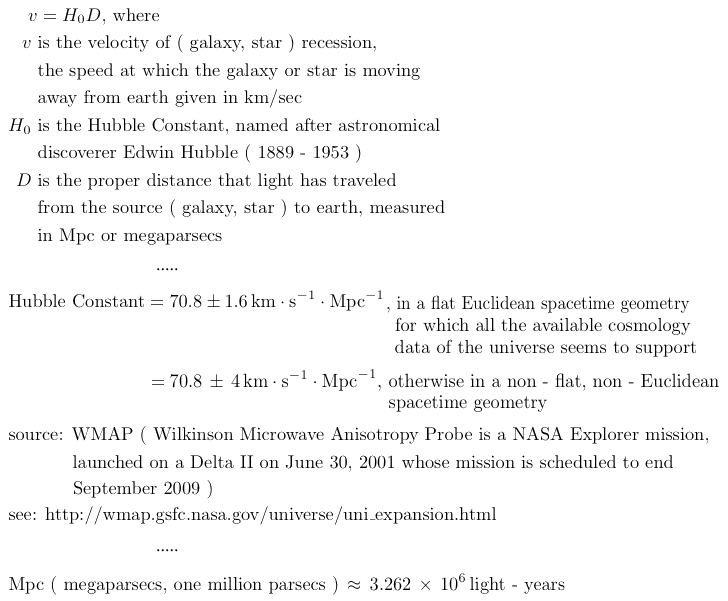 ; however, each and every one of the previous equations can be almost transferred whole to the macro universe. That is, receding and approaching bodies and galaxies, each by themselves, define a self - contained inertial frame of reference. 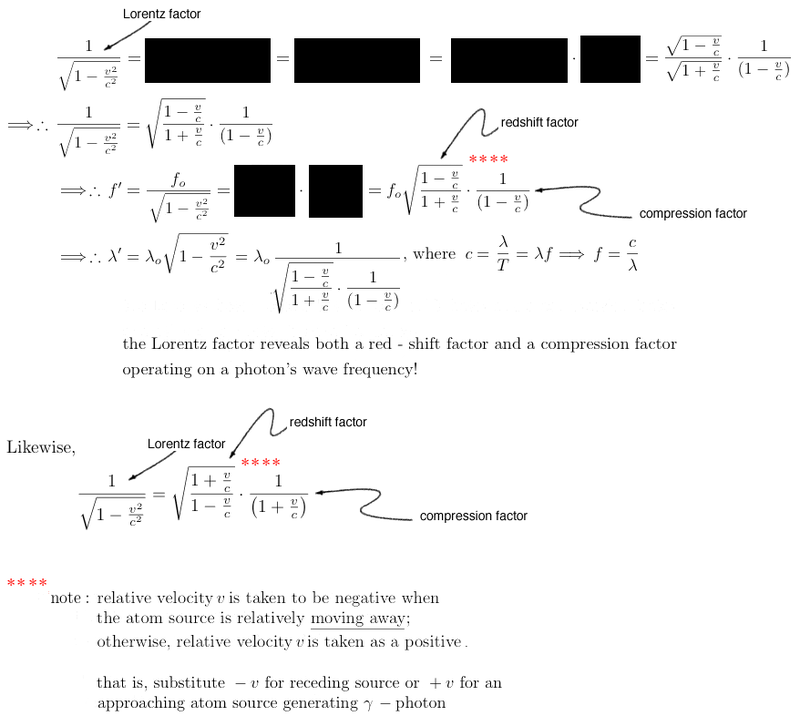 is the Doppler factor giving a mathematical expression to the Doppler Effect. 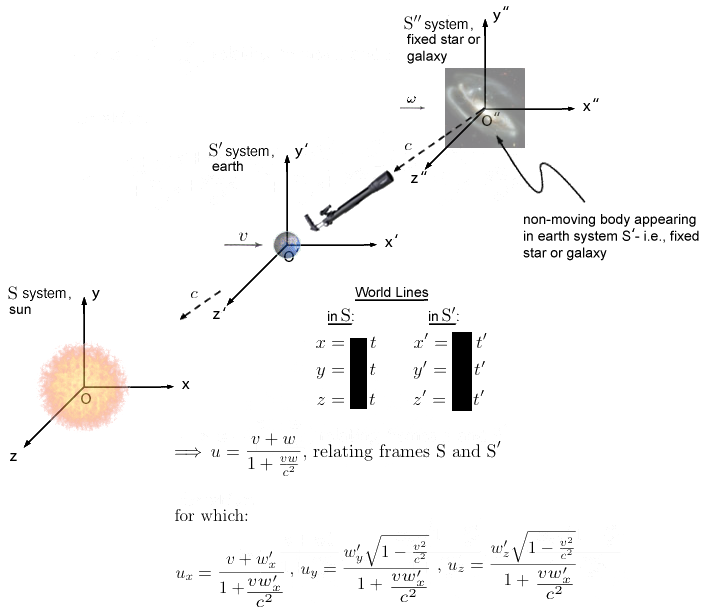 Because of earth's motion about the relatively stationary sun, all telescopes on "platform earth" which are imagined to reside on stationary "platform sun" owing to the great cosmic distances involved, must be constantly adjusted in terms of a deflection angle when pointing at a given [ relatively ] fixed star or galaxy. 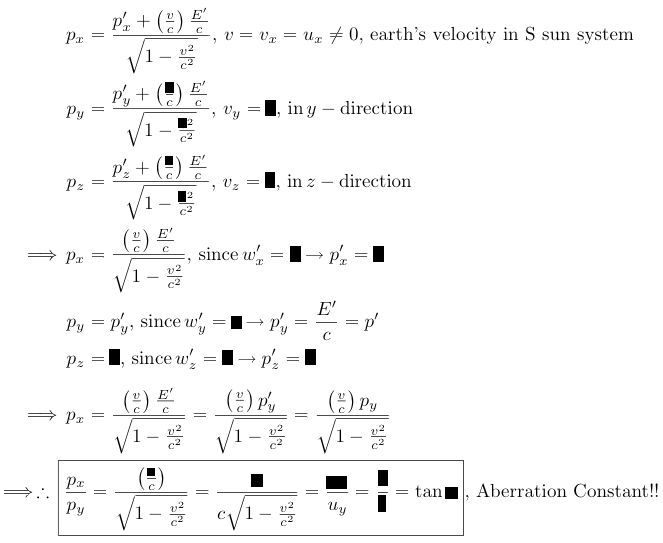 That is, as earth moves with relative velocity about [ relatively ] stationary sun, any telescope on "platform earth" must not point to the true star or galaxy position but rather must point to a position in the night sky which is displaced in the direction of earth's velocity ; and, notwithstanding our intuitive emotional feeling that earth is standing still, we must start to consider everything in this analysis from the point of view of [ relatively ] stationary sun owing to the Copernican Revolution ( Polish: Mikolaj Kopernik, 1473 - 1543 ) for the heliocentric model of our solar system. 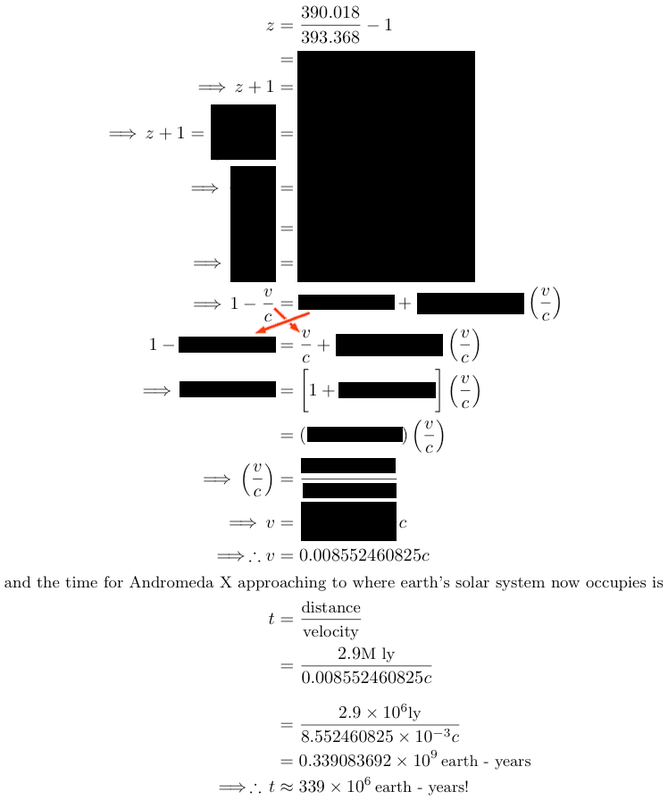 since we are observing the path of starlight just within earth's x - y plane. 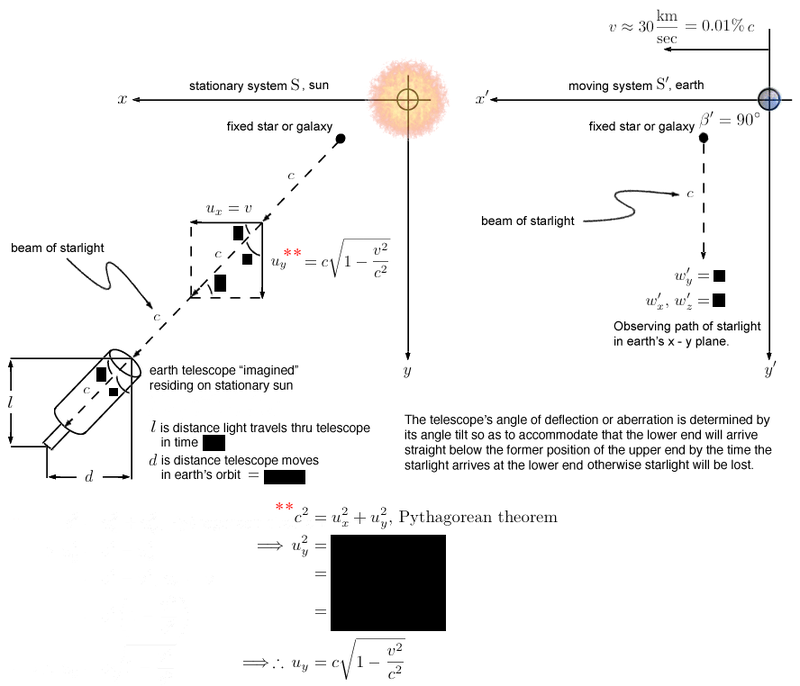 That is, the angle of deflection and hence the amount of relativistic aberration of light is determined by the angle of incoming starlight into the telescope and the relative motion between the sun's stationary frame of reference and earth's relatively moving frame of reference as can be seen in the above Abstract #1.
where is the angle of deflection for relativistic aberration of starlight which must be maintained for any telescope on "platform sun" pointing at a [ relatively ] fixed star or galaxy throughout earth's traverse about the [ relatively ] fixed sun! 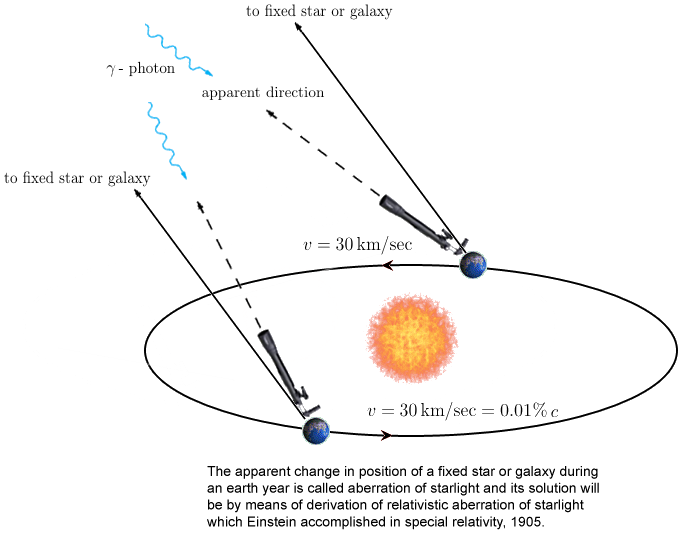 That is, is the angle of deflection for relativistic transversal aberration of starlight that must be maintained for any telescope on "platform earth" pointing at a [ relatively ] fixed star or galaxy throughout earth's traverse about the [ relatively ] fixed sun! 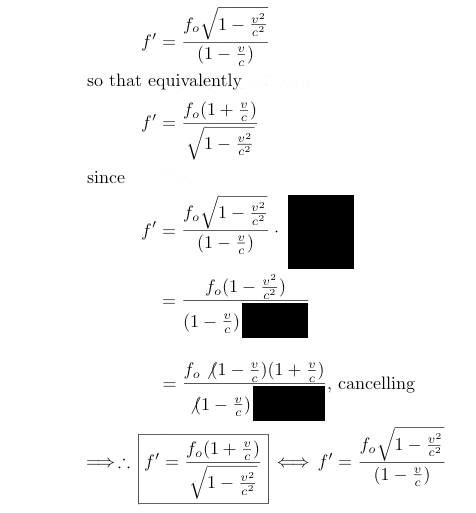 Go to 'Star Aberration Derivation' to see how this 1905 Einstein calculation is accomplished. 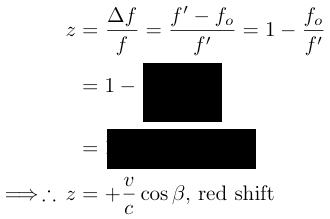 Relativistic red - shift z can now be utilized to estimate velocity of a receding galaxy and the time it took to arrive at its present position relative to earth's solar system. 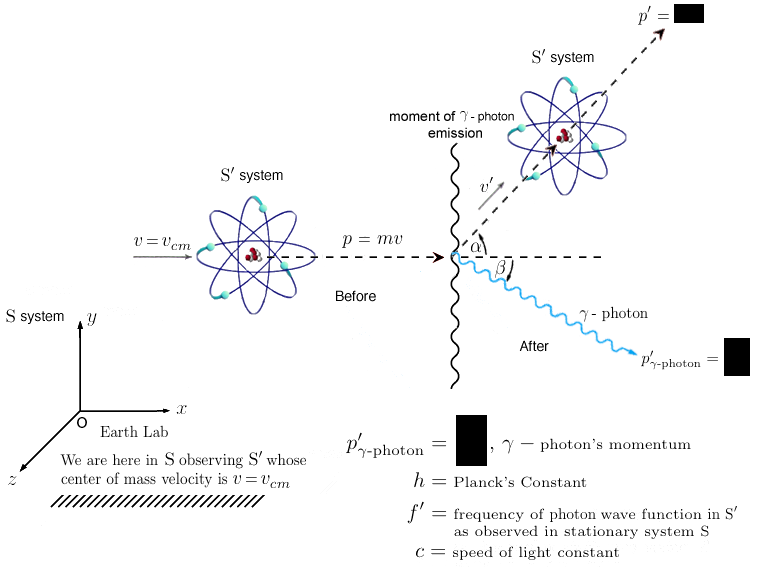 Again, what this signifies is that because of Lorentz transformation of relativistic moving inertial frames of reference, that there are inherently analogous and different energies for equivalently different [ gamma - photon ] frequencies as revealed by the Doppler Effect! Using well established cosmology techniques for measuring black hole masses by the amount of accreting falling masses, a black hole's energy at the event horizon can be fairly well measured according to a recent paper by Prof. Hagai Netzer of Tel Aviv University, Israel, along with Jian - Min Wang, Pu Du and Chen Hu of the Institute of High Energy Physics of the Chinese Academy of Sciences and Dr. David Valls - Gabaud of the Observatoire de Paris. This energy can then be compared to the amount of energy radiation from a given black hole reaching earth in determining the universe's rate of expansion and hence very large cosmic distances with a very high degree of accuracy. 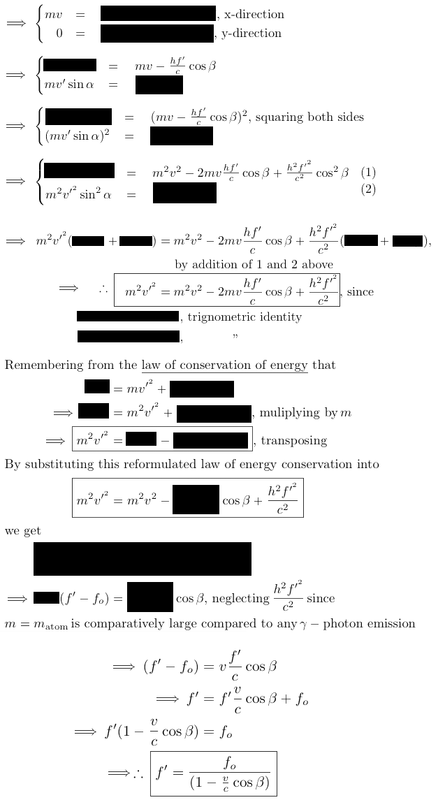 See: "Super - Eddington Accreting Massive Black Holes as Long - Lived Cosmological Standards", publication date: 02/2013, reference: 2013PhRvL.110h1301W, Physical Review Letters, vol. 110, Issue 8, id. 081301. 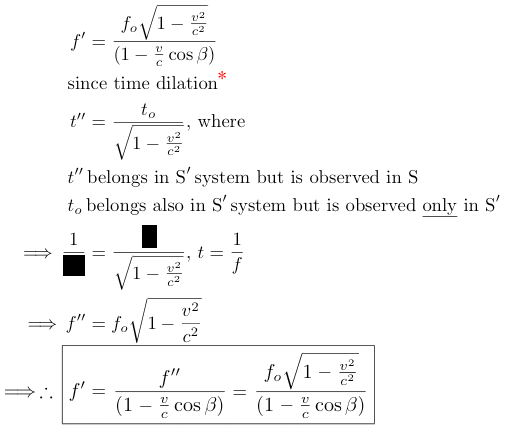 One admission that must be stated is that earlier Doppler was itself derived from time dilation and therefore there is a tautolgoy being expressed here. 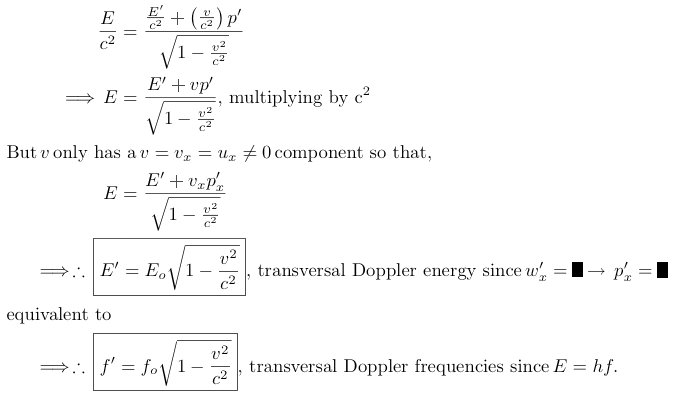 However, Doppler can and should be derived separately by means of the original Lorentz Transformation Equations which David Bohm's "The Special Theory of Relativity" accomplishes and to which in some later recapitulation of Relativity Science Calculator this author will submit a simplified version of this derivation. 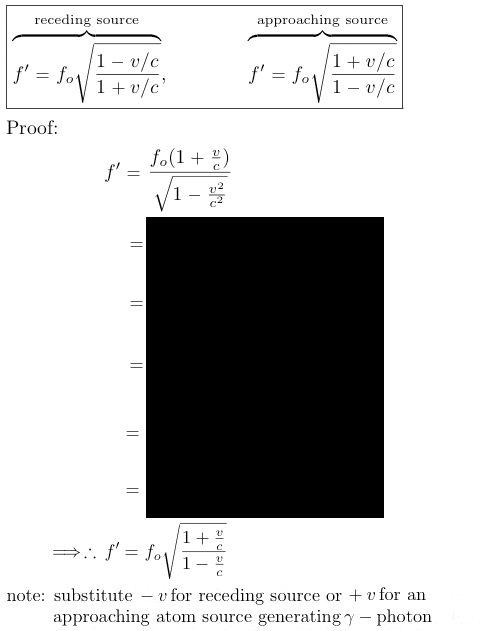 In the meantime, everything shown here is both mathematically and experimentally true and valid. 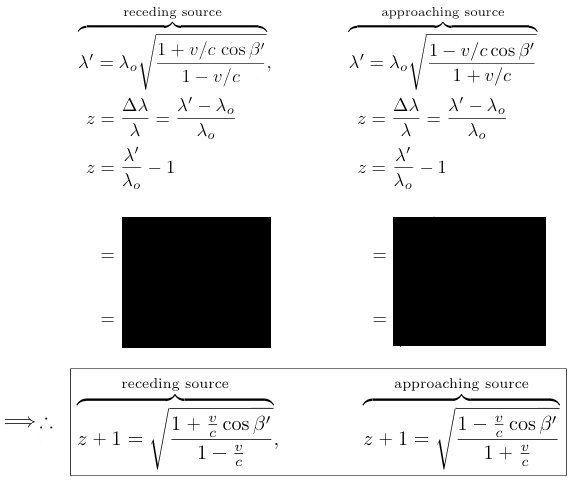 Cosmological Consequence: One cosmological and perhaps philosophical consequence of these equations is how as the universe inexorably expands outwards at ever unimaginable velocities, that for some future intelligent cosmologists the night sky goes completely dark in The Big Freeze. Here is the essential cosmological paradox: any future observer of the universe will observe a shrinking amount of the universe since it takes more and more time for the distant edges of light to reach an observer's eye in an ever more greatly accelerating and expanding fabric of space - time universe!! In other words, any future observer of the sky's universe will see less and less of an ever more expanding universe! One main reason is because the wavelength of whatever light is received from the farthest edges of the cosmos ( the cosmic horizon at about 13.7 billion ≈ 14 billion light - years distance from earth ) will exceed the diameter of the observed universe. And, since it will be impossible to ever build a large enough telescope to receive an infinite wavelength of such light due to Doppler Effect and extremely attenuated energy and frequency of this light, it will, by any sort of cosmological mathematics, be impossible to see such light!! Hence, the light goes out in the known observable universe for any sentient intelligent observer still alive in approximately 1 trillion earth - years, plus or minus another 100 million earth - years!! In this situation also, the observed universe, if such a thing is even possible, will be flat since all observed wavelengths of whatever electromagnetic propagation will equivalently be observed as being essentially non - sinusoidal or flat. 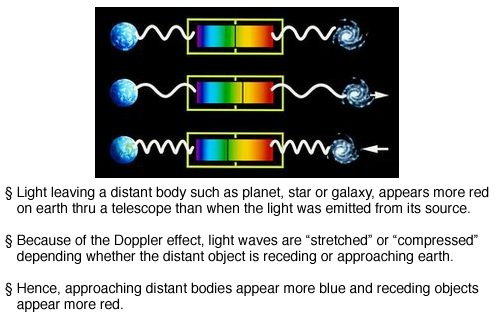 Just simply imagine looking at a drawn - out string without any crest - to - crest wavelength due to extreme Doppler or redshift and hence no frequency; this, then, will be whatever "light" reaches an observer's eye or telescope -- neither the observer's eye nor his telescope will see anything due to infinite wavelength and extreme Doppler or redshift! 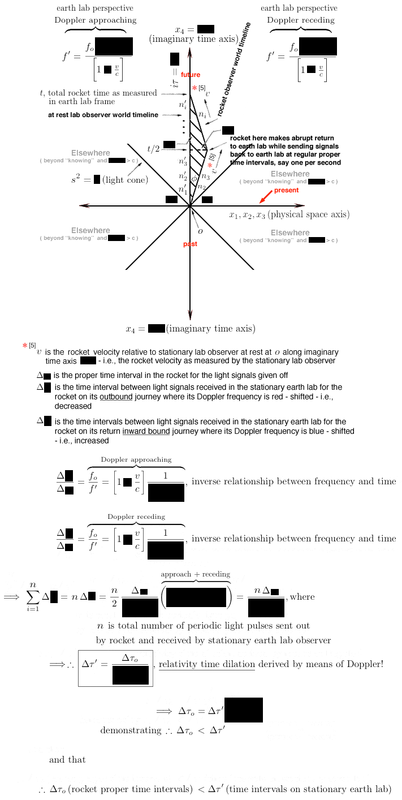 Additionally, any intervening ionized interstellar dust or gases will bounce any incoming electromagnetic propagation of extremely low energy content ( light, x - ray, whatever ) away from an observer's eye or telescope similar as to how presently earth's Ionosphere bounces AM radio waves back to earth at much longer distances than otherwise straight - line distances on earth would allow. In other words, all observers and their telescopes would be "seeing" and "living" from within a black hole: an inside - out black hole!! Finally, because there will be no stellar objects to see with everything having gone black for both "night and day", there will be no need for the human mind to create an accounting for the motion of bodies, which is precisely what time is ! 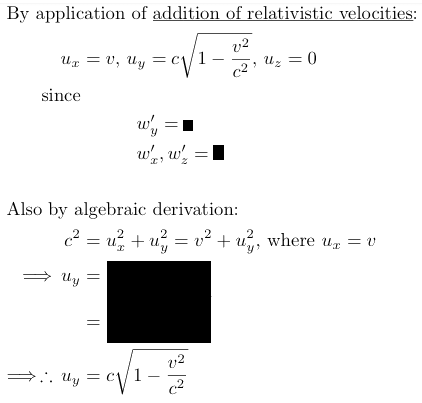 In fact, distance and velocity will no longer be calculated since these mathematical quantities will no longer be required in this eventual and ultimate world of physics. The mathematics of Doppler, the law of energy conservation, Hubble's equation and the inexorable expansion of the universe dictate this ultimate fate. And there is absolutely no escaping this ultimate cosmological fate!! It's called The Big Freeze. Parallel Universes: See: Michio Kaku, Max Tegmark and Hugh Everett for articles giving cosmological reasoning for the existence of parallel universes. 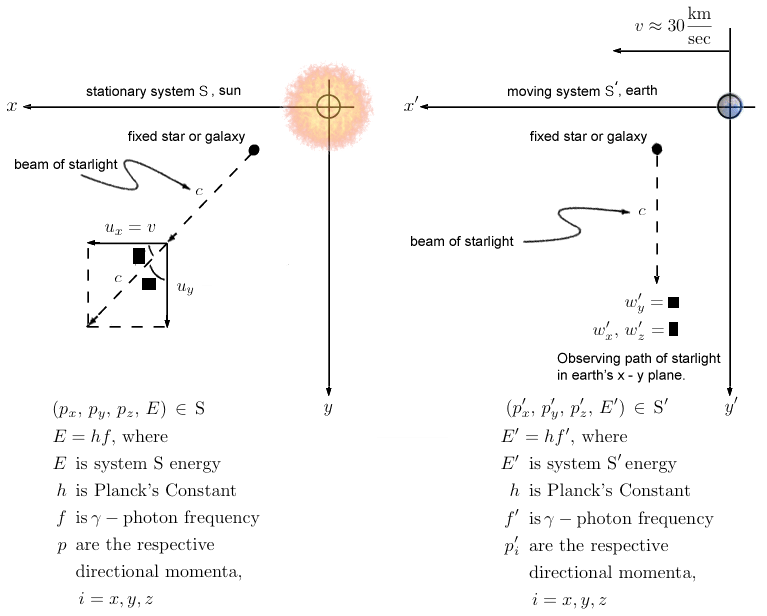 Conclusion: The relativistic aberration of starlight only predicts a slight change in frequency depending upon the velocity of the approaching or separating star or galaxy whereas the speed of light forever remains unalterably constant!